Want to see what happened in previous Years? (there are videos and photos.) Then go to the Past Winners List and click on the year number. Wyegate Index: Info, Ben's Press Report, Snippets, Rider's Say, Gallery, Videos, Team Results, Section Statistics., Bike Stats+. Update 22Jun: Final Results are now available on the right. These are exactly the same as Version 2 but with added awards text. Although the next round is a long way off it could be worth getting your entry in now. 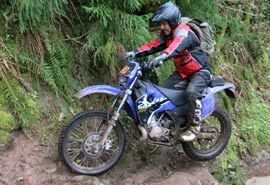 After a postponement due to heavy snow a month ago, the first round of the ACU Trailbike trials championship got underway in the lower Wye Valley and the better weather made for a tight finish at the top of the 35th annual Wyegate trial. 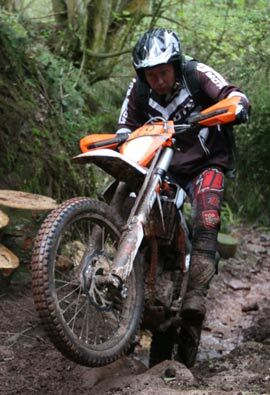 Just half a second separated winner Jason Bendall from Simon Welch over the tie-breaking special test, after both finished on no marks lost on observation, along with Andy Foot and Martin Gilbert. All four recorded a perfect score on clerk of the course Rod Jones's 80 mile, eight hour-plus tour of traditional green lanes, so it was down to a dash across a field near the lane the trial gets its name from to act as a tie breaker. Jason held his nerve, and the throttle wide open, to record a much-sought after first Wyegate win. 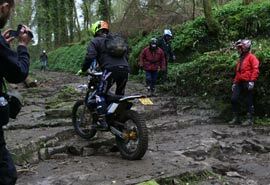 After a loosener at Mork Hill, Gurllus Grove's narrow gully made for a tricky test, then the 120 or so riders encountered the first tough challenge of the day at Limekiln Woods. 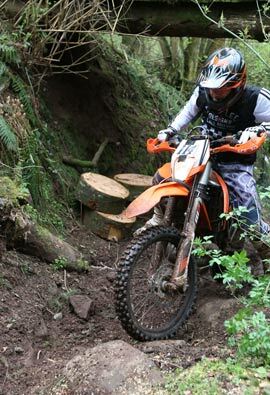 A long rocky gully was followed by the feared slab steps, then tricky ruts to finish. 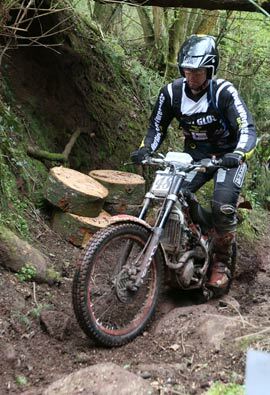 Gurllus took a mark apiece off pre-65 winner Steve Allen and second placed Matthew Welch – while Allen is a seasoned campaigner on his Royal Enfield Bullet 350, the smaller Crusader 250 model machine was new territory for Matthew who was enjoying his first outing on his dad Tom's pride and joy. 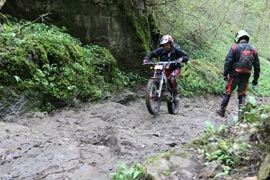 To finish just ahead of former trial winner Steve Grindle and fellow-mounted BSA B40 runner Sam King was no mean feat for him and the bike. 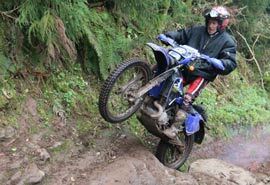 With 32 sections attempted just once a year, the Wyegate throws up all manner of surprises, and with the weather making for generally drier sections, one slip of concentration was all that was needed to slide down the leader board. 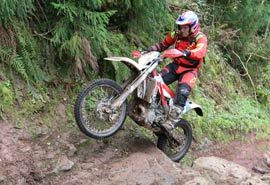 Devauden 1's tricky ruts took another former event winner Henry Bendall for a three mark loss, and cost top ten runner Kevin Stannard a mark and Matthew Welch two. 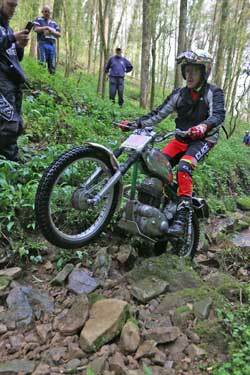 Henry overcame that and a five on Limekiln 1 to clean right until the penultimate section of the trial in Forge Wood. Similarly a five on Nannies Lane 2 put Mike Hughes out of a top spot chance while Joe Bendall and Dave Cottle held their concentration better to dab just three times throughout the event. 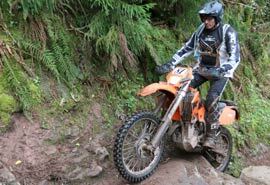 Surely a candidate for ride of the day was Tom Pike, aboard a Kawasaki KDX 220, a bike far less suited to the sections than many others. To lose just eight marks was a very creditable score. 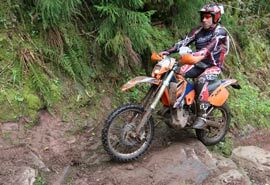 Standard route winner Nick Worgan had a good ride on his KTM Freeride 250 two stroke to pip Steve Grinter aboard his Honda XL185 by a mark. 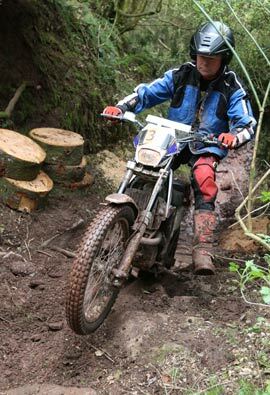 The result means Simon Welch, riding long time Wyegate campaigner Tony Falconer's Pampera for the first time, leads the championship for eligible machines with Cotswold-turned Derbyshire star Foot second and Devon ace Gilbert in third before the next round on August 12, run by Neath MCC. A couple of items found by our marshals: A Waterproof 'Boil-in-the-bag' Top and Tool bag. Contact admin@wgdfmcc.org.uk . Lets face it. 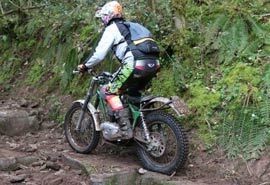 Everyone has their opinion about what defines a Trail Bike so, just for your own satisfaction, take a look through the results over the years and re-allocate the Wyegate Cup to what bikes you think should have been eligible. 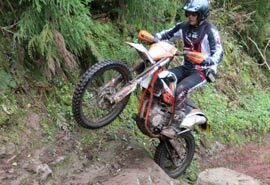 I have, and my list includes Suzuki SP370s, XL185s, DT175s and lately A KDX220. But, start being too picky about what you would allow in and you don't have an entry. 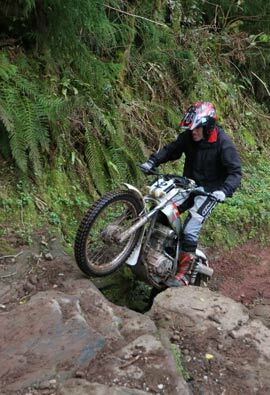 Luckily, we have an entry that just enjoys riding regardless of winning awards and hopefully the need to beat your friend/husband/brother/dad won't get in the way of the enjoyment element. We had a very pleasant thank you from one of our residents who runs a stud farm along the route, to thank our bike riders for the considerate way they drove past their place and through the village last Sunday. So keep up the good work you riders. It was a pleasure to see so many people out there, like us, enjoying the countryside in almost ideal weather conditions, (Did you get wet in that 10 O'clock shower?) with a lot of horse riders out and about and so many cyclists there could have been a Sportive going on. What a difference a month makes with our weather. The Team award goes to a northern contingent Team 6t9, who were Stephen KENNY, Kevin STANNARD and Andy FOOT, dropping just 13. Next were local West Glos members 'Once Weres', who were Mike HUGHES and Joe and Henry BENDALL, loosing 19. On a sobering note, We lost 2 friends of the Wyegate over the last month. 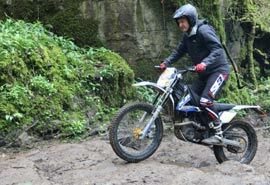 Jim Cullimore from Bristol who organised LDT's that a number of our members thoroughly enjoyed riding back in the 70's and 80's. When we said we would like to run one too. Both Jim and Barbara gave us guidance and support in how to put on such a big event. Both Jim And Barbara are sadly missed. We also lost Bill Kershaw, a gentleman and hero to many of us. He helped us locate and re-use some classic sections from the 50's thanks to his personal knowledge of many of the Usk Vale sections and lanes. Bill spent many years working with WTRA as Chair and with rights of way issues. 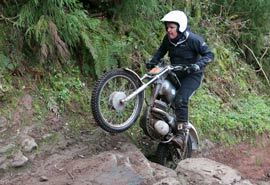 He had ridden the ISDT back in the 60's for the Welsh team. 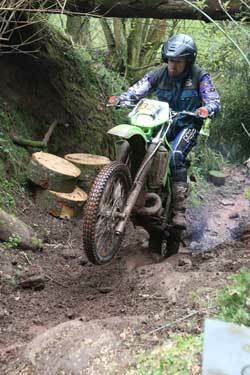 One fond memory I have was of Bill pulling wine, glasses and a spread of cheeses from his rucksack when we were running an Enduro special test together and that was after riding half a lap at Bill's usual fast and efficient pace, no breakages. Bill often featured in the top end of the Wyegate results and won the over 45's award when he was 60. An honour to have known and ridden with him. 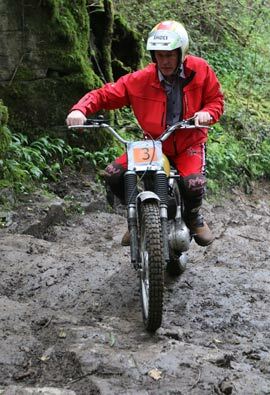 Sadly, we learned that just before the Trial that we also lost a great friend in Dougie Clarke who was the hero of the Wyegate's early Sidecar years after competing with his one working arm controlling clutch throttle and brake on his modified Honda 'Sleepy wing' sidecar in 1983 and 85, with Martin Gerrish keeping the chair down. 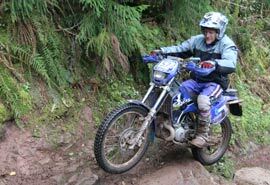 Many of us will have met Dougie as he scrutineered our bikes in Enduro events for decades. Did you notice that we bunched all the Championship contenders together at the front of the entry so that there wasn't too much 'changing conditions' effect. 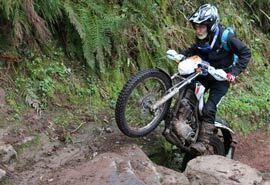 Not sure it worked well enough though, as I was 3rd rider through most sections and seemed to be settling loads of rocks down beneath me. (Yea yea, I know. It was just me.) Of course there were a number of you who thought it worth risking the wrath of the course closer's just to wait for the rocks to settle. Hint - Simon Welch was up the sharp end and cleaned everything nicely! If everyone takes too long to walk the sections and we carry on finishing that late then the only option is to have less sections. Do you want that? Me, I'd rather have less miles and more sections. Pembroke was too far west for those 2 sections in my opinion. The club has really pushed the ACU online entry system that is available for Licence holders (which you all have to have.) It has made the work-load less for us by being able to split Entry Sec work from Secretary and Results team, which proved itself this time as poor Rich had to cope with all the hassle of rescheduling and refunds etc. 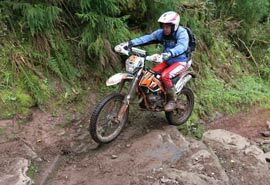 and with reinstating entries who could ride on the new date. Not to mention the way it could also cope with the reserve entry system - which we had to use with the increased demand for this event. Rich thinks that was hard work - he should have tried how it was done when we started the Wyegate 35 years ago - 'Computers! we didn't even have electric typewriters!' 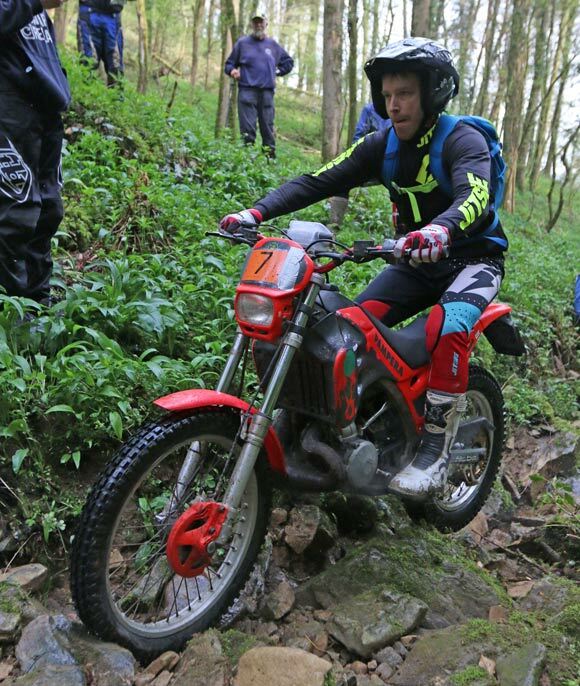 It is inevitable that we will need to cater for a very few manual entries but that can be at club meetings or via our supporting local dealer/rider/grafter/treasurer's Cinderford bike shop Haines & Co.
Max Hawkins says: Here's my thoughts! One of the beauties of the Wyegate is it's an ever changing event. Too many clubs have only one or two people who lay out so the ground is often used in the same way. Because West Glos change personnel you get a different sort of trial from one year to the next, which keeps it fresh. I don't like the long loop down to Usk but others love it so there's no argument there! ... I fancy you are lucky as a club to have different people who will take up the mantle , long may it continue as it's an excellent event every time I turn up and I reckon for about 99%. of everybody else. Bruce Bendall says: Just wanted to say thank you to all for yet another brilliant Wyegate and congratulations to Jase , you finally did it bro! No breakdowns and only minor injuries so all in all a fantastic day, ... Once again we’ll done and thank you all. See you next year. Martin & Nick Worgan say: We thoroughly enjoyed Sunday, maybe it was the weather or scenery, but the road mileage didn't feel too bad. It was nice to have a lot of straightforward 'up the lane' type sections, the roadbook was spot-on and it was a very tasty pie at the Orepool! Rich Beale says: Fantastic event on Sunday! 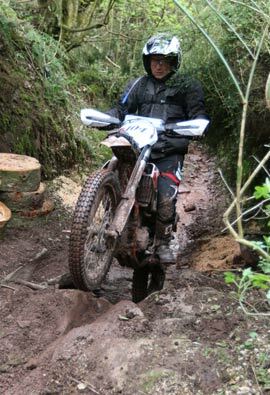 great sections and a super route around The Valley. Big thanks to organisers and especially the observers who had to be patient with us! 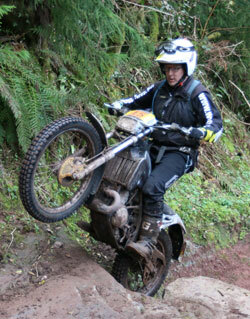 Ian Williams says: Cracking event, it was my first LDT and hooked. 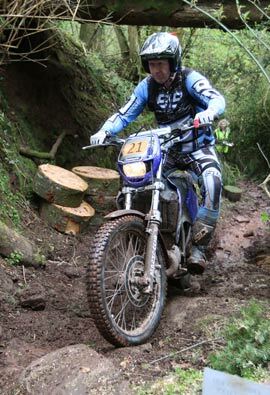 I have been riding enduro for years and didn't’t really know what a LDT was, what great fun, a good day out. It was a good route and had a bit for everyone, ups and downs with a few nice rest breaks ... well planned. 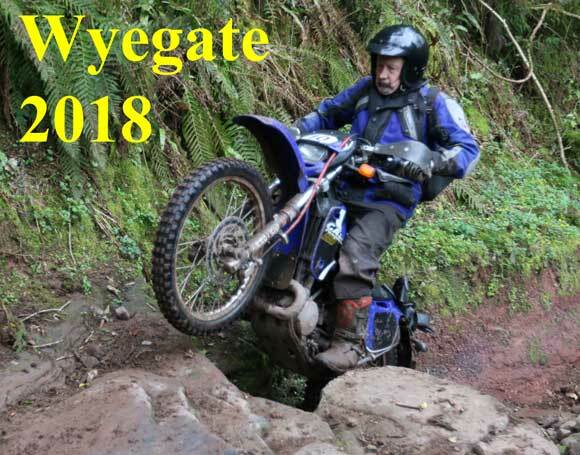 Ian Thompson says: Thanks to all at WGDFMCC for another superb Wyegate, with the return of some interesting classic sections and, I think, one or two newcomers. The hard-working observers deserve a special mention with many running two sections and even recovering lost kit from the course - cheers Brendon for finding and returning my goggles. The Welches say: ... enjoyed the Wyegate, please pass our thanks to all the club workers, it must be quite an undertaking. 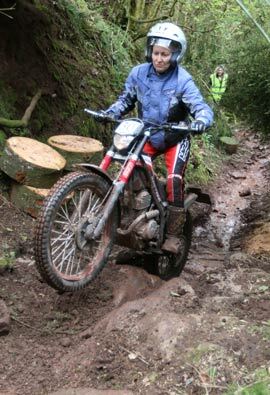 Jez Bray & Mick Thurman say: We finished early due to bike troubles and running out of time, thanks again for providing a great event, hope it all went well hope to see you next year. 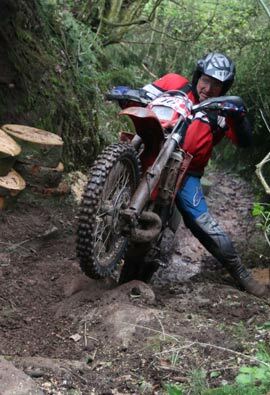 If any riders would like shots emailed to them then please ask (Jackie took loads more than shown). admin@wgdfmcc.org.uk All pics copyright and credited to Jackie Jones. 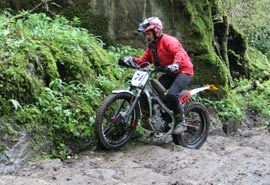 The current points leader for the ACU Trail Bike Trials Champions Simon Welch. Riding it like he stole it. 'You won't get far though as the Owner is watching in the background - Steward Tony Falconer. 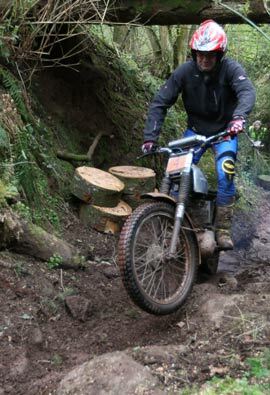 2012 Wyegate winner - No, not Colin, The bike, with Rob Breakwell on board. 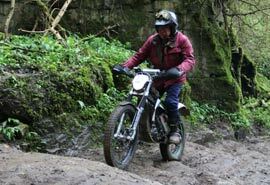 Here are a few clips from the event filmed by Viv Jones who was disappointed not to be riding too. To view in HD you need to click the HD or Vimeo link to open on their site. Orange means rider on Championship route. All 3 riders needed to finish to score points. To claim a physical award then all 3 riders needed to be on the Championship route. What the heck, we might as well have Club stats here too.